Yesterday I attended my first ever blogger conference: BritMums Live. Before I went I was a bag of nerves: would I be exposed as a bit of a fraud among the big league of 'proper' mummy bloggers with their beautiful sites and regularly updated posts? Would anyone talk to me? Would I ask stupid questions? Would I overshare something hugely embarrassing? I needn't have worried, I had an absolute ball. I learnt loads, I met lots of lovely people and I came away inspired and with a little bit more of a concrete plan for taking blogging forward in the future. Oh, and whoops, I did kind of share something hugely embarrassing in front of the whole conference - although I did get Cherry Healy's new book out of it! There was so much to absorb, so I'm going to list some of the key things I learnt at BritMums Live while they're still fresh in my mind. In the coming weeks, I plan to expand a bit on some of them, so watch this space. I'll also mention some of the lovely bloggers I met, so you can be inspired by them too. Set goals and believe in yourself. Once you've set your goals, create good habits to keep you on track. And build a team, if there's stuff you really struggle with, pay someone else to do it for you. Julie Creffield, Too Fat To Run. We're in control, we're in charge of our audience, so we set the rules...and we have the power to break all the rules if it works for our blog. Vicki Psarias-Broadbent, Honest Mum. If you are looking to work with brands, your blog needs to have a defined niche and audience. Having a clear niche also helps in developing a content plan. Jess Dante, Socially Jess. If you want to start earning money from your blog, your blog needs to look slick - well designed and with an email address that matches your domain - and you need to be consistently posting quality content. Clarify who your audience is and what your niche is and use that information to develop a plan for what content to post that will be useful for your target audience. Jess Dante, Socially Jess. Think about where you film your vlog: the environment (kitchen, bedroom, lounge, outside) can add to the story you are trying to tell. Nigel Camp, The Video Effect. ALT text for images is not about SEO, it's about ensuring your site is accessible, something that is required under the Disabilities Discrimination Act. It also helps your images appear in Google Image Search. You should NOT be using ALT text tags to try and boost your SEO by including spammy key words (unless those keywords are useful for image search or describe the content of the image for people with little or no sight). Judith Lewis, DeCabbit Consultancy. Behaviour - what are they doing, where are they going and how long are they spending on your blog? What do you need to adjust to change this behaviour? Conversions - what are your visitors worth to you? Are they doing what you want them to do? Break down the data to decide where to take your blog and what content to post. Gori Yahaya, Digital Garage at Google. 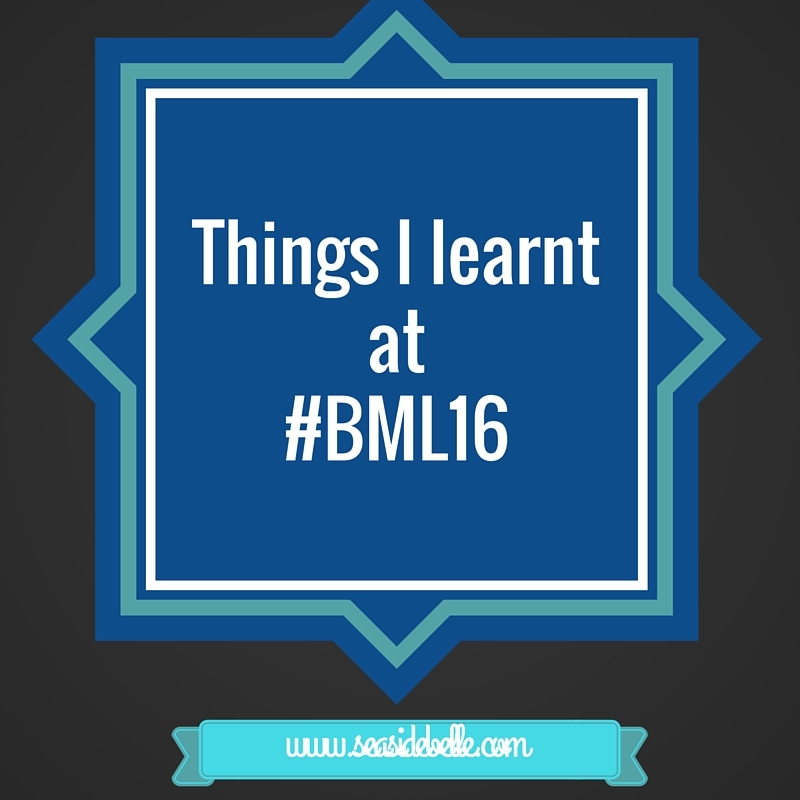 One of the reasons lots of bloggers go to BML and other events is to socialise. I'll be honest, it wasn't top of my wish list. I'm massively sleep deprived at the moment and, as a result, I can be a bit anti-social. But the atmosphere is so relaxed and friendly that I couldn't help but get chatting to others. It can be a bit freaky to half recognise someone from having seen their picture on their blog and then think you know them in real life before realising you don't and they probably don't know you from Adam. But a smile and a hello is usually enough to spark a conversation. For me, the most valuable session for getting to know other bloggers was the round table on content. It was really helpful to listen to others talking about their blogs and their audience and then to collaborate to suggest ways of taking the content forward. In fact, it was so good that we stayed past the end of the session to learn more. So many thanks to: BattleMum, Mummy's Gin Fund, No More Shoulds, Only Girl In The House, Morgan's Prince, Classlist, and the others I've forgotten to include. Nail your niche - what exactly is your blog about, how is it different to other blogs and what makes is special? Clarify who your audience is - once you know exactly who you're writing for, you'll find it a lot easier to come up with content, develop your style and sell your blog to advertisers. Decide on a key message for each piece of content - what do you want that content to achieve? This helps with measurement and growing your blog by giving it a purpose. Have fun - enjoy the ride and don't be afraid to take on challenges - even if that means sharing your most embarrassing stories with a room full of strangers! 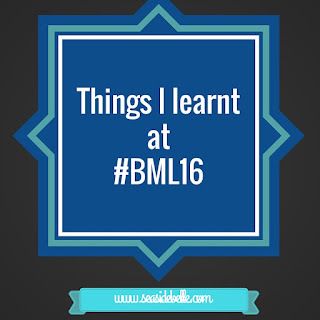 What are your key takeaways from #BML16? Thanks for the shoutout (though if I remember I also shouted that tip) ;-) Glad your experience was awesome for the whole day - it is quite something amazing! You're welcome Thanks for all the tips - so much to cram into one session!